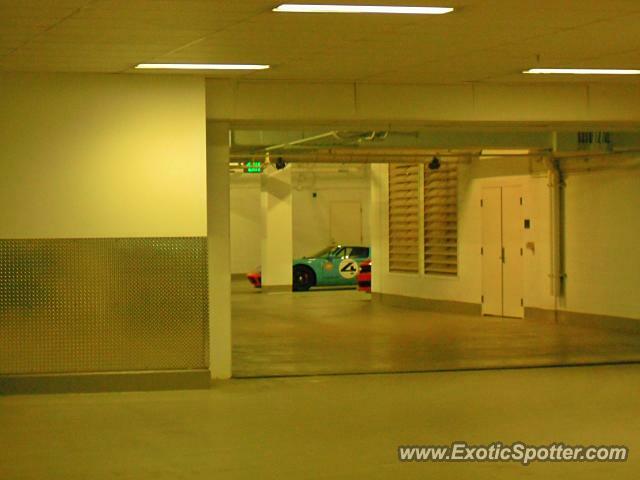 Hiding in the back of this garage only showing us a little of her is the owners rare Heritage Edition Gulf colors GT. Only 343 made and this is number 4. The owner also has a red Ford GT, as well as a 458 Spider and a 911 Turbo. The owner lives in the very expensive penthouse area above this garage and since this car was just spotted in Cali and all his other cars are gone I think he brought them to his second home in Cali during the winter. Thanks West and I agree, it left me somewhat anxious to see it up close cause I couldn't get any closer for the photo. I like this shot Nick, makes it look mysterious. I was able get some really close ones of his red one I have 2 on my page but it was backed up against the wall like this one is so I couldn't see the plates. I tried looking at the red GT but can't see a badge. True haha, the preferred kind cause less time is spent looking and more enjoying. Thank you! His other GT is red with a white stripe also so it would be cool if its the same guy. In that case he might own at least 3 houses. love these types of shots - nice find and nice work!